The ruling BJP on Friday won all the five municipal corporations and registered thumping victories in Nagar Parishad and Nagar Panchayat polls in Jharkhand. RANCHI: In a big boost to Prime Minister Narendra Modi and his chief election strategist and party president Amit Shah, the ruling BJP on Friday won all the five municipal corporations and registered thumping victories in Nagar Parishad and Nagar Panchayat polls in Jharkhand. The victory holds significance for BJP since it was the first time that the polls were held on party lines in Jharkhand. While BJP's Asha Lakra won the Mayor's post in the Ranchi Municipal Corporation, Sanjiv Vijayavergiya won the Deputy Mayor's post, State Election Commissioner NN Pandey told a press conference after counting of the votes. While Lakra defeated Jharkhand Mukti Morcha's Varsha Gaadi, Vijayavergiya trounced Congress' Rajesh Kumar Gupta. Roshni Tirkey won the Mayor's post in Hazaribagh Municipal Corporation defeating Gunja Devi of the Congress and Raj Kumar Lal won the Deputy Mayor's post by trouncing Anand Dev of Congress. In Giridih, Sunil Kumar Paswan won the Mayoral post beating Congress's Samir Raj Choudhary while Prakash Ram won the Deputy Mayor's post by defeating Mohammad Istiak of the Congress. In Adityapur Municipal Corporation, Vinod Srivastav defeated Congress's Yogendra Sharma for the post of Mayor while Amit Singh won Deputy Mayor's post defeating Manoj Mahto of Jharkhand Mukti Morcha. For Medininagar Municipal Corporation, Aruna Shankar defeated independent candidate Punam Singh to win the Mayor's post, Rakesh Kumar Singh defeated Congress's Manoj Singh for the post of Deputy Mayor. The BJP also performed well in the Nagar Parishad and Nagar Panchayat polls. The BJP also performed well in the Nagar Parishad and Nagar Panchayat polls. The party won seven posts of president and five vice president in 16 Nagar Parishads. The opposition parties - JMM and Congress - managed to win four and two president posts respectively, and two and three of vice president posts, respectively. In Nagar Panchayat elections, the BJP won nine president and five vice president posts of the total of 14 Nagar Panchayats. The polling for the keenly contested Jharkhand Municipal Elections 2018 (Jharkhand Nagar Nikay Chunav 2018) was held on April 16. The elections were held for five Municipal Corporations (Nagar Nigam), 16 Municipal Councils (Nagar Parishad) and 13 Nagar Panchayats in Jharkhand on April 16. Bypolls were also held at four local bodies – Jhumri Tilaiya, Deoghar, Dhanbad and Bishrampur. The election to the 34 local bodies in Jharkhand witnessed a triangular fight between Bharatiya Janata Party (BJP), Congress and the Jharkhand Mukti Morcha led by Shibu Soren, which has a strong voter base in the tribal regions. An overall voter turnout of 65.15 percent was recorded in the Jharkhand civic body polls, with the lowest voter turnout recorded in the state’s largest urban local body - Ranchi Municipal Corporation. 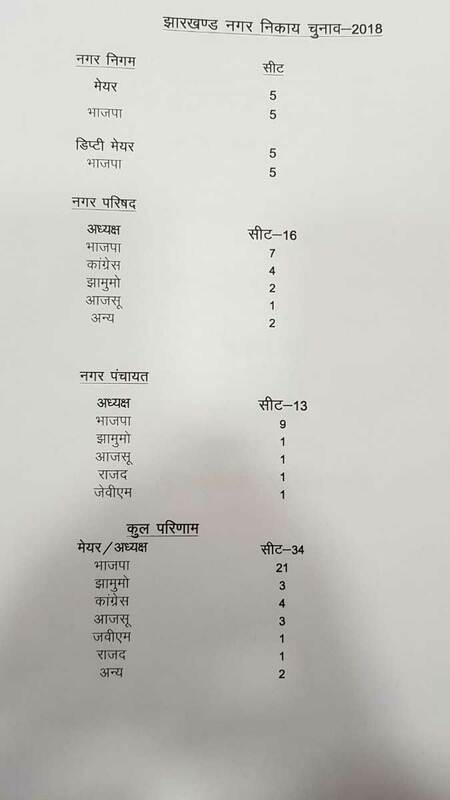 Here is the detailed list of winners in Jharkhand local body polls 2018. The BJP performed well in the Nagar Parishad and Nagar Panchayat polls. The party won seven posts of president and five vice president in 16 Nagar Parishads. The results of the local body polls in Jharkhand are out. Ruling BJP has swept all the five municipal corporations and registered thumping victories in Nagar Parishad and Nagar Panchayat polls in Jharkhand. Jharkhand CM Raghubar Das has given the credit for BJP's victory in the polls to Prime Minister Narendra Modi and party president Amit Shah. "This is the victory of PM Modi's policies and Amit Shah's guidance. This vindicates the developmental work done by the government in the state. BJP is leading in 8 seats, Congress in 5, AJSU 1 and others in 2 seats in the Jharkhand Nagar Parishad election results. 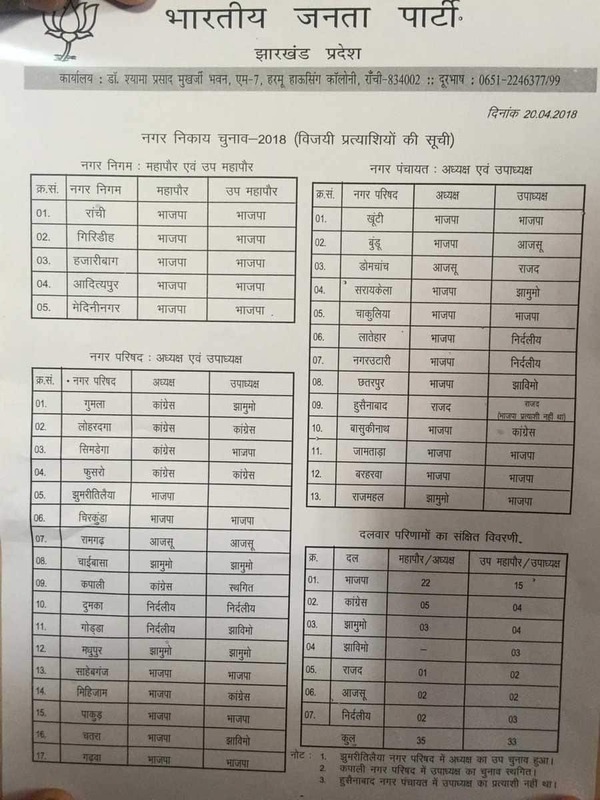 The 16 Nagar Parishads for which polling was held on April 16 are – Garhwa, Chatra, Madhupur, Godda, Sahibganj, Pakur, Dumka, Mihijam, Bishrampur, Chirkunda, Phusro, Ramgarh, Lohardaga, Gumla, Simdega, Chaibasa, Kapali, Jhumri Tilaiya, Nagaruntari, Hussainabad, Chhattarpur, Latehar, Domchanch, Rajmahal, Barharwa. Read details here. In the 18 seats for Nagar parishad polls, BJP is leading in 8, JMM in 2, Congress in 5 and AJSU in 1. BJP has won all 5 mayoral seats. Ranchi, where BJP's Asha Larka was the mayor, was initially trailing but she emerged as the winner with a huge margin. Read details here. In Godda Nagar Parishad, Independent candidate Pratyashi Jitendra Mondal wins. JVM candidate Pratyashi Benu wins Deputy post. Jitendra Pathak has won Latehar Nagar panchayat ward number 2 by 149 votes. Ruby Devi has won from Latehar ward number 6. Sajeeda Khatoon has won from Hazaribagh ward number 2. BJP is currently leading in Latehar, Hazaribag and Koti. BJP is currently leading in Simdega. Jharkhand witnessed a triangular fight between Bharatiya Janata Party (BJP), Congress and the Jharkhand Mukti Morcha. Counting of votes begins in all 34 local bodies and 4 by-polls. 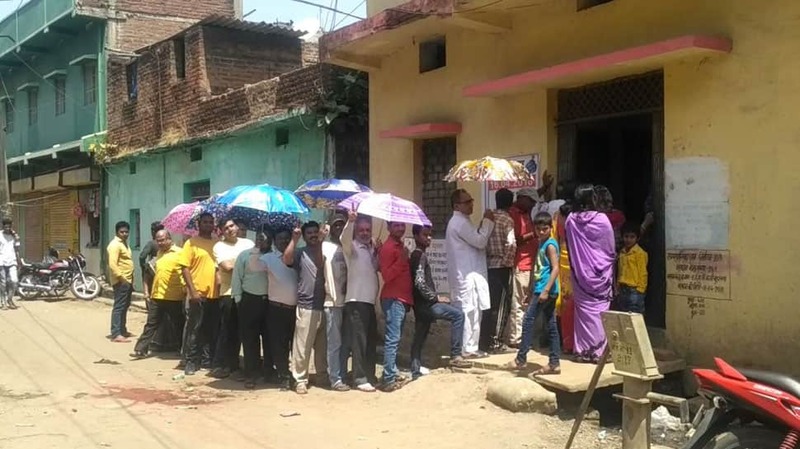 The polls were held for five Municipal Corporations (Nagar Nigam), 16 Municipal Councils (Nagar Parishad) and 13 Nagar Panchayats in Jharkhand on April 16.